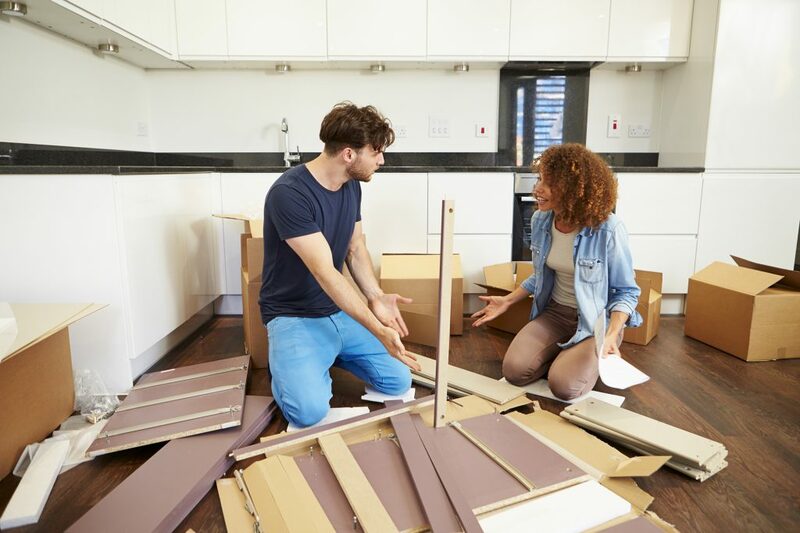 Couple struggling and frustrated with their attempt at flat pack furniture assembly. Don’t let your flat pack furniture get you down. Are you looking for the easiest furniture assembly experience? Do you want only a top furniture assembly professional to come to your home to transform that box of loose pieces of wood and fittings into your beautiful dresser or bed frame? With Now We’re Moving, you’ve come to the right place. We have all the tools we need for the job in hand. Did you just move into a new house? Haven’t had the time to purchase a full tool set? Worried how you’re going to turn those many IKEA boxes into a fully formed sofa or wardrobe ready to be enjoyed without a drill? Our furniture assembly professional you book will arrive with the full compliment of tools we need to make your dreams of a fully furnished home come true — drill, screwdrivers, allen keys rubber mallets, and more. We can turn your frustrations into a beautiful piece of work. Our furniture assembly experts will have your furniture up quick and carefully. We are dedicated to providing 100% customer satisfaction. We’re only happy if you’re happy! These are generally simple to build but as soon as there is storage they will take longer. We aim to be clear about exactly how we charge for our service. Below explains our rates and why we charge this way. All of our quotes are for a fixed price assembly, so you will know you will be paying nothing more. We assemble furniture daily with the job we do and are familiar with most items on the market. So when you contact us for a quote, we have usually built it or something very similar. As of October 2018, the typical rate is £47 for the first hour and then £35 per hour in quarter of an hour increments, this does vary depending on how fa we have to travel. 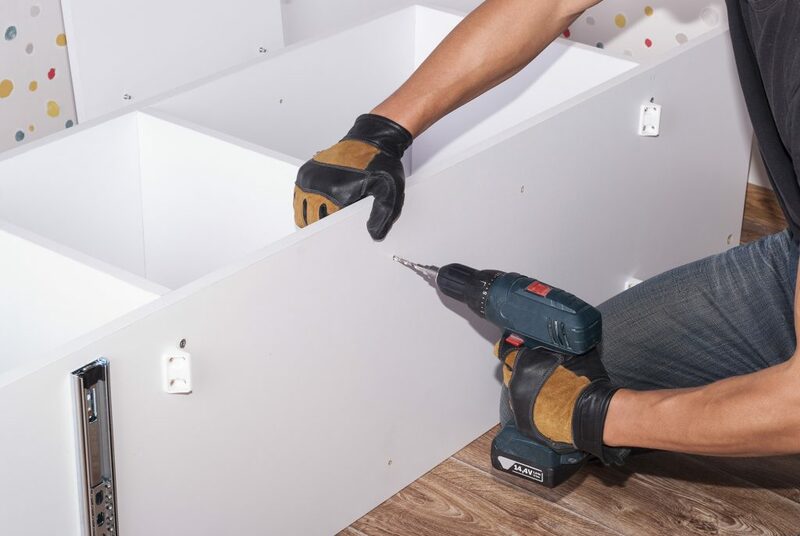 Rather than focus solely on the rate have a look at the section below to get an idea of how much assembling your furniture will cost, we are a lot quicker than you might think and assemble in 1/4 to 1/2 the time most people do who are good at DIY. An Internet Link for each item. OR the Supplier Name, a Description and Part Code. There are usually a lot of parts any of which can influence the assembly time. It is usually quicker and far more accurate if you COPY & PASTE or PHOTOGRAPH your RECEIPT and email it to us. We cannot accept attachments via the website, so when you fill in the form in the contact us page, you will receive details of your nearest assembler by email. If you reply to this with your attachment, it will be routed directly to the assembler to give you a quote. Email us the name of the product and say we can find it on a website such as Argos, Homebase, Next etc. There are so many similarly named products, that the chances are we could pick the wrong one. We will do our best to help, so please provide a photograph of it assembled (if you can a couple of internal and external shots) to give us an idea of what we have to do. If not, we will only be able to give you an hourly rate and won’t be able to offer a fixed price on it. This happens a lot, and unfortunately we cannot give a fixed price. All we can say is that it should not be more than a certain amount. We cannot know what we need to do to correct any mistakes you might have made. 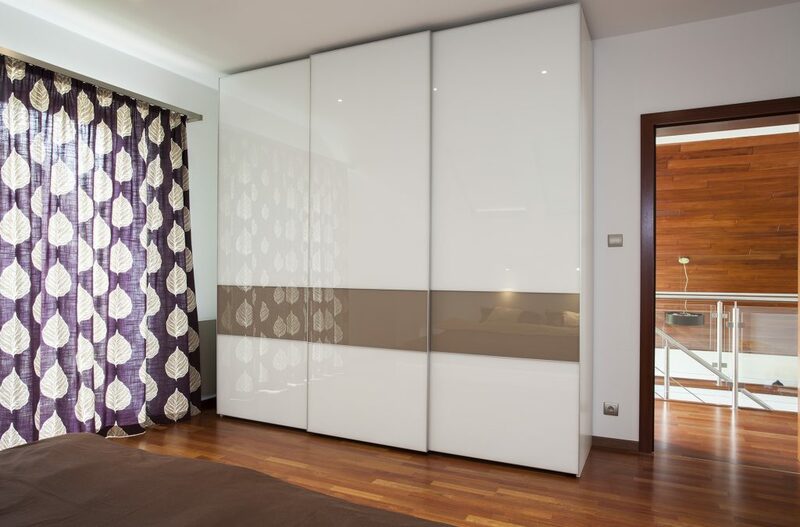 For example, you might have built the frame for a sliding door wardrobe and just want us to build and mount the doors for you (approx.1 hours work). However, we might have to spend some time levelling the frame you have built, before we start to ensure the doors run and close properly, which might mean it will take around 90 mins instead. We work out how long it will typically take then apply an “hourly rate” to get a price, after the first hour this is charged in quarter of an hour increments, to work out the quote. There was an exceptional reason for an increase in time i.e. you had created more work for us for some reason such as changing your mind half way through, or you requested additional items to be assembled. Working in tight spaces can also cause problems, generally we need a space of 2 feet around the item when it is lying down. Please note: We only use our own staff members, we do not sub-contract our work! We offer discounts for OAPs and military personnel. We can also collect the goods from the store and deliver them to you before assembling the furniture. Delivery costs vary depending on distance and volume of goods. Rick and his lads carried out our move with great efficiency,good humour and courtesy. Nothing was too much trouble for them and the whole move went very smoothly. I can highly recommend Rick and his company and will soon be using them for another move. Excellent throughout the whole process, Rick came out to view the property and his removal team were outstanding causing zero stress to be felt by my partner and I. Would recommend to anyone and very reasonably priced for the service received. Thanks Rick and team. I am an ex military man and I have moved 15 times before Rick & his team moved us at the end of October this year. I can safely say without a show of doubt, this was the smoothest my family and I have experienced. Nothing broken or even slightly damaged. The communication from start to finish was second to none, nothing was too much trouble. The lads, Nick, Luke Lee & Rick arrived 10 minutes early and started setting the van top before knocking on the door at the arranged time of 7.45am. They were all dressed exactly the same in matching uniform (something you don’t always see!) and as a military man, I appreciated that. The price was also the best we had received from the 5 other companies. (some ridiculous, especially from the national companies) The move of 3 fully loaded Luton vans were loaded and unloaded in less than 8 hours (including a 45 minute drive from house to house) have already recommended to our friends who are moving shortly, and Rick very kindly brought round a lovely bottle of red to say thank you the recommendation!………… I can’t thank you enough. 10/10 John. Id like to thank you and your guys for making our move yesterday successful. The were very professional, hard working and funny…. thanks again. I just want to say a huge thank you for making my moving day go so smoothly. your team of 3 arrived ahead of schedule, all very politely introduced themselves came and had a look at my flat and then simply got on with loading up, all done super quick time nothing dropped, even got my bulky furniture down the stairs without me realising. I had a hold up waiting for my keys so sent them off for a cuppa and when i did get my keys the guys were at my new house before me. At my new house I let the guys know where to put stuff and they were all done in 45 minutes. super service, polite, friendly, very professional. I am glad I picked you for my move and i would have no hesitation in recommending you to anyone. Rick and his team were great and went to a lot of trouble to help with my move down in Bournemouth. Was fab to hook up with Rick again after not seeing him for so many years! Thank you guys for being a great team and so lovely we are very very grateful to all of you . If you’re thinking about who to go with just do it and pick these guys best service and best price for miles around. See you for karaoke soon! Ricks team moved us house yesterday and for an event that is meant to be so stressful I was very relaxed! Wayne, Luke and Jordan arrived at 0745 and after a quick chat and brew they were working at speed, but with care. They had our whole house and garage done in just under 2 hours. Then when we eventually got the keys they were already waiting at the new place, unloaded again in under 2 hours. The main thing for us was that nothing was broken (had some previous bad experiences!) but on top of that all 3 guys were genuine nice guys and made our move so smooth and chilled and that enabled us to be excited about getting our keys! Thank you! Will recommend to anyone moving!!! These guys are amazing. They took the stress out of moving day, worked so hard, so friendly and made us laugh. Fantastic service from start to , highly recommended. Thank you for such a great service. Nick , Wayne and “PC” were fabulous, very organized. Very hard working, the move was so stress free especially for elderly parents (who throughly enjoyed the happy crew) so pleased you were recommended to us ! Excellent service from Rick and his team. Competitive price and great communication in the weeks before the move as we negotiated dates. Took all the stress out of moving day. The lads were professional, friendly, helpful and worked incredibly hard. Thanks again. Great job – tidy, thoughtful, courteous and efficient – thanks guys! The move was over 2 days, and I have to say, the lads (Rick, Luke, Nick & Leeroy) did extremely well considering the other companies quoted our move over 3 days and wanted over double the amount! Yes we have a 4 bedroom property, We didn’t think it required 3 days to do the move and some of the prices were astronomical. They started at 7am and were loaded by 1pm, made their way to Cornwall and stayed overnight. They delivered our belongings at 8.30am assembled 4 beds and 2 wardrobes, and were finished by 12.45 and were on their way! nothing broken whatsoever. Have already recommended to others. Fantastic service!!! Thank you for being such stars! I’d like to thank Rick, Nick, Luke and Justin for a magnificent job well done. Completely stress free, and I have been ill for some time leading up to the move and almost called it off…. Im glad I didn’t now. You guys were amazing. So fast, so efficient. Thank you so much, have recommended you to my niece. We were very happy with the removal crew. They worked very fast, carefully and soon had the house cleared and loaded up. The unloading at the new address went very smoothly and efficiently. The team was very friendly and helpful throughout, making sure we had the least possible worry on what is traditionally a very stressful day. We would recommend your firm to anyone. Keep up the good work! Five Stars as far as we are concerned! Rick and his team were amazing. Arrived on time and never rushed me, my retired parents or my ill partner. They packed everything in their vans with a great amount of care. Not one item was damaged and was put away in the rooms required. The price quoted was extremely reasonable as well. Thank you so much guys. If i ever need to move again these are the people i would call. We were very happy with the removal crew. They worked very fast, carefully and soon had the house cleared and loaded up. The unloading at the new address went very smoothly and efficiently. The team was very friendly and helpful throughout, making sure we had the least possible worry on what is traditionally a very stressful day. Ricky and his team are extremely professional and friendly. The moving experience was made easy and smooth. All the staff are helpful and very careful. I would thoroughly recommend Now We’re Moving! Now We’re Moving are a family run removal company based near Bath, who takes pride in the work we do. Whether you are moving next door or to the other end of the country, We offer removal services with a simple, stress-free moving experience.